If you were to randomly click a hyperlink on this web page and keep doing so on each page that followed, where would you end up? As an esteemed user of Azimuth, I’d like to think you browse more intelligently, but the above is the question Google asks when deciding how to rank the world’s web pages. Now don’t panic! I have no reason to think you might enter a superposition of locations or tunnel through a wall. This merely forms part of a recent drive towards understanding the role that network science can play in quantum physics. As we’ll find, playing with quantum networks is fun. It could also become a necessity. The size of natural systems in which quantum effects have been identified has grown steadily over the past few years. For example, attention has recently turned to explaining the remarkable efficiency of light-harvesting complexes, comprising tens of molecules and thousands of atoms, using quantum mechanics. If this expansion continues, perhaps quantum physicists will have to embrace the concepts of complex networks. To begin studying quantum complex networks, we found a revealing toy model. Let me tell you about it. Like all good stories, it has a beginning, a middle and an end. In this part, I’ll tell you the beginning and the middle. I’ll introduce the stochastic walk describing the randomly clicking web surfer mentioned above and a corresponding quantum walk. In part 2 the story ends with the bounding of the difference between the two walks in terms of the energy of the walker. But for now I’ll start by introducing you to a graph, this time representing the internet! • Mauro Faccin, Tomi Johnson, Jacob Biamonte, Sabre Kais and Piotr Migdał, Degree distribution in quantum walks on complex networks, arXiv:1305.6078 (2013). What does the internet look like from above? As we all know, the idea of the internet is to connect computers to each other. What do these connections look like when abstracted as a network, with each computer a node and each connection an edge? While such representations might be awe inspiring, how can we make any sense of them? Or are they merely excellent desktop wallpapers and new-age artworks? In terms of complex network theory, there’s actually a lot that can be said that is not immediately obvious from the above representation. This shows that very few pages are linked to by a very large number others, while a very large number of pages receive very few links. More precisely, what this shows is a power law distribution, the signature of which is a straight line on a log-log axis. In fact, power law distributions arise in a diverse number of real world networks, human-built networks such as the internet and naturally occurring networks. It is often discussed alongside the concept of the preferential attachment; highly connected nodes seem to accumulate connections more quickly. We all know of a successful blog whose success had led to an increased presence and more success. That’s an example of preferential attachment. It’s clear then that degree is an important concept in network theory, and its distribution across the nodes a useful characteristic of a network. Degree gives one indication of how important a node is in a network. And this is where stochastic walks come in. Google, who are in the business of ranking the importance of nodes (web pages) in a network (the web), use (up to a small modification) the idealized model of a stochastic walker (web surfer) who randomly hops to connected nodes (follows one of the links on a page). This is called the uniform escape model, since the total rate of leaving any node is set to be the same for all nodes. Leaving the walker to wander for a long while, Google then takes the probability of the walker being on a node to rank the importance of that node. In the case that the network is undirected (all links are reciprocated) this long-time probability, and therefore the rank of the node, is proportional to the degree of the node. So node degrees and the uniform escape model play an important role in the fields of complex networks and stochastic walks. But can they tell us anything about the much more poorly understood topics of quantum networks and quantum walks? In fact, yes, and demonstrating that to you is the purpose of this pair of articles. Before we move on to the interesting bit, the math, it’s worth just listing a few properties of quantum walks that make them hard to analyze, and explaining why they are poorly understood. These are the difficulties we will show how to overcome below. • No convergence. In a stochastic walk, if you leave the walker to wander for a long time, eventually the probability of finding a walker at a node converges to a constant value. In a quantum walk, this doesn’t happen, so the walk can’t be characterized so easily by its long-time properties. • Dependence on initial states. In some stochastic walks the long-time properties of the walk are independent of the initial state. It is possible to characterize the stochastic walk without referring to the initialization of the walker. Such a characterization is not so easy in quantum walks, since their evolution always depends on the initialization of the walker. Is it even possible then to say something useful that applies to all initializations? • Stochastic and quantum generators differ. Those of you familiar with the network theory series know that some generators produce both stochastic and quantum walks (see part 16 for more details). However, most stochastic walk generators, including that for the uniform escape model, do not generate quantum walks and vice versa. How do we then compare stochastic and quantum walks when their generators differ? With the task outlined, let’s get started! In the next couple of sections I’m going to explain the diagram below to you. If you’ve been following the network theory series, in particular part 20, you’ll find parts of it familiar. But as it’s been a while since the last post covering this topic, let’s start with the basics. where there is at most one edge between any two nodes, there are no edges from a node to itself and all edges are undirected. To avoid complications, let’s stick to simple graphs with a finite number of nodes. Let’s also assume you can get from every node to every other node via some combination of edges i.e. the graph is connected. In the particular example above the graph represents a network of nodes, where nodes 3 and 4 have degree (number of edges) 3, and nodes 1, 2 and 5 have degree 2. This is nice, since (as seen in parts 16 and 20) a self-adjoint matrix generates a continuous-time quantum walk. To recap from the series, a quantum walk is an evolution arising from a quantum walker moving on a network. A state of a quantum walk is represented by a size complex column vector . Each element of this vector is the so-called amplitude associated with node and the probability of the walker being found on that node (if measured) is the modulus of the amplitude squared Here is the standard basis vector with a single non-zero th entry equal to unity, and is the usual inner product. The probabilities are guaranteed to be correctly normalized when the Hamiltonian is self-adjoint. There are other matrices that are defined by the graph. Perhaps the most familiar is the Laplacian, which has recently been a topic on this blog (see parts 15, 16 and 20 of the series, and this recent post). The Laplacian is self-adjoint and generates a quantum walk. The Laplacian has another property; it is infinitesimal stochastic. This means that its off diagonal elements are non-positive and its columns sum to zero. This is interesting because an infinitesimal stochastic matrix generates a continuous-time stochastic walk. To recap from the series, a stochastic walk is an evolution arising from a stochastic walker moving on a network. The probabilities are guaranteed to be non-negative and correctly normalized when the stochastic Hamiltonian is infinitesimal stochastic. So far, I have just presented what has been covered on Azimuth previously. However, to analyze the important uniform escape model we need to go beyond the class of (Dirichlet) generators that produce both quantum and stochastic walks. Further, we have to somehow find a related quantum walk. We’ll see below that both tasks are achieved by considering the normalized Laplacians: one generating the uniform escape stochastic walk and the other a related quantum walk. • the symmetric normalized Laplacian (that generates a Quantum walk). The identical diagonal elements indicates that the total rates of leaving each node are identical, and the equality within each column of the other non-zero elements indicates that the walker is equally likely to hop to any node connected to its current node. This is the uniform escape model! That the diagonal elements are identical in the quantum case indicates that all nodes are of equal energy, this is type of quantum walk usually considered. Puzzle 1. Show that in general is infinitesimal stochastic but not self-adjoint. Puzzle 2. Show that in general is self-adjoint but not infinitesimal stochastic. So a graph defines two matrices: one that generates a stochastic walk, and one that generates a quantum walk. The natural question to ask is whether these walks are related. The answer is that they are! The mathematics is particularly nice because is self-adjoint. A self-adjoint matrix is diagonalizable, and has real eigenvalues and orthogonal eigenvectors. • the quantum walk generator to which it is similar! Sadly, this is where we’ll finish for now. We have all the ingredients necessary to study the walks generated by the normalized Laplacians and exploit the relationship between them. Before I leave you, let me tell you about a workshop the ISI team recently attended (in fact helped organize) at the Institute of Quantum Computing, on the topic of quantum computation and complex networks. Needless to say, there were talks on papers related to quantum mechanics and networks! • Giuseppe Davide Paparo and Miguel Angel Martín-Delgado, Google in a quantum network, Sci. Rep. 2 (2012), 444. • Eduardo Sánchez-Burillo, Jordi Duch, Jesús Gómez-Gardenes and David Zueco, Quantum navigation and ranking in complex networks, Sci. Rep. 2 (2012), 605. • Silvano Garnerone, Paolo Zanardi and Daniel A. Lidar, Adiabatic quantum algorithm for search engine ranking, Phys. Rev. Lett. 108 (2012), 230506. It was a fun workshop and we plan to organize/attend more in the future! This entry was posted on Monday, August 5th, 2013 at 3:36 pm and is filed under mathematics, networks, physics. You can follow any responses to this entry through the RSS 2.0 feed. You can leave a response, or trackback from your own site. Great post! I especially like how you use quantum versus stochastic walks to organize your treatment of the various Laplacian-like operators associated to a graph! Previously these various operators seemed like a bit of a mess to me. It would be good (and probably not hard) to generalize this whole discussion to weighted simple graphs, i.e., those with a positive number labelling each edge. The idea is that the adjacency matrix of a weighted graph is a matrix of numbers where is the weight of the edge between to , or zero if there’s no edge. Weighted graphs are important because in general, ‘not every link is created equal’. Things in general flow more easily, or more often, through some edges than others! Also, as we let the weight of an edge approach zero, our weighted graph can be seen as approaching a graph where that edge doesn’t exist. So, we get a nice topology on the set of all weighted graphs with a given set of vertices. And if you think about it a while, the resulting space of weighted graphs is just the space of symmetric matrices with nonnegative entries. So the math should get very nice. Actually, in the paper we work entirely on weighted graphs (which are natural both for stochastic and quantum evolution). However, the tricky thing is about interpretation of the Hamiltonian (i.e. a Hermitian matrix) with real, nonnegative entries. If it were just for real entries, it would be a Hamiltonian with time-reversal symmetry. But do you have any ideas how to interpret the restriction on having only nonnegative entries? Piotr, can you rephrase the question? Do you mean a ‘physics’ interpretation, or a ‘graph/ranking’ interpretation? For ordinary QM, on typically has H=T+V where T is kinetic part, i.e. laplacian, and V is the potential; some interaction term. In the above post, V=0. For graphs, the entries forming the laplacian must, by definition, sum to zero: the diagonal entries are positive, off-diagonal are negative. I don’t get your time-reversal comment at all: for time-reversal in QM, you must change the sign of both time and energy (i.e. the energy eigenvalues); so this has little to do with the signs in the matrix. And stochastic systems are essentially never time-reversible (frobenius-perron eigenvalue gives the rate of decay to equilibrium). This doesn’t generalize to quantum systems, instead you get a kind-of poincare recurrance or ringing/beating/interference effect. So: free-associating: I’m guessing that perhaps your all-positive entries are trying to capture some net flow from one part of the graph to another. OK, this last sentence doesn’t actually make sense, I’m thinking aloud. Oh, never mind. I just realized you were asking about the last sentence in John’s post. I thought you were asking about something else entirely. Piotr knows this, and we’re even working on this topic together, but: Time reversal symmetry should be with respect to a specfic quantity. Assuming no spin, and when considering transfer probabilities, then Hamiltonians with real entries in the site basis generate time-inversion symmetric transition rates. I will be going to China in a few minutes, and will be there until August 20. During this time I may not post to this blog very often, or at all. Almost everything developed here also applies equally well to any homogenous space, right? That is, the vector is replaced by a point p in the homogenous space, and the various matricies above by group elements of whatever group it is that is acting on the homogenous space. This abstraction is very rarely done; I’ve always wondered what I’m missing because of it. I figure there are two reasons for this: 1) the authors are not familiar enough with the general idea of homogenous spaces to be able to make specific claims that they’re confident of (heck, I’m certainly not), and 2) some part of the problem definition fails to generalize. The 1) I can excuse, but 2) leaves me hanging. Great comment, interesting point. I think I largely fall into the first category: not knowing much about homogeneous spaces. I agree, there should be no problem mathematically transfering what we’ve done here onto a continuous space. For the quantum case this would just be something like the standard single particle Schroedinger equation in a potential with a modified kinetic energy term to account for the geometry of the network. The classical case would some similar stochastic diffusion equation. I’ll have a think about this! Well, I think I’m saying that both quantum and classical are special cases of a general framework. The classical case uses points that live in a simplex (total probability sums to 1); Markov matrices relate/move the various points. The quantum case uses points that live in CP^n (viz, the n-body wave-function) with U(n) matrices to relate/move the various points. The general case has points on some general manifold, with some matrices to move them around. To keep some amount of symmetry/invariance in the problem, it seems like the manifold should be a homogenous space. The Schroedinger eqn is a thing that lives in the tangent space of the manifold. … Perhaps what I’m saying is that I don’t understand why the Laplacians are what they are. I mean, I understand at the shallow level: the quantum case must be symmetric, to get unitarity; the classical case must decay, to get probabilities that sum to 1. These are given axiomatically: these are the rules of the game. What’s the general case? How is the specific manifold forcing the Laplacian into the specific form its taking? I don’t quite see this ‘big picture’. Perhaps the reason that the formalism for unitary quantum and stochastic dynamics above has not been generalized (to our knowledge) is that it is unclear what other physical objects and evolutions that would fall under this generalization. Perhaps one is the generalized quantum dynamics, where a physical object , the density matrix (trace 1, Hermitian, positive), is evolved according to , where is not a Hamiltonian, but some superoperator that leads to the preserving of the trace, Hermiticity and positivity, e.g. , where is Hermitian. In fact, in this formalism you could simultaneously include both quantum dynamics under the symmetric normalized Laplacian and the stochastic dynamics under the asymmetric normalized Laplacian. When we’re back at ISI after the holidays, I’ll raise your point with the others there, and see what they think. By the way, I fixed your LaTeX. The correct way to use LaTeX on this blog is described right above the box where you type your comments. You need to include the word ‘latex’ in the manner described. Sorry it took a while to approve your comments—I’ve had intermittent access to the internet. The difference between the finite automata and what you are doing is that in the finite automata, the graph edges are labelled with a symbol (the monoid element), and thus a graph walk corresponds to a sequence of symbols (edges walked). A random walk on a graph induces a measure on the set of strings of symbols (aka ‘the language’). If the random walk is independent of the history of the path, then it is Markovian, and the measure factorizes. (if random walk is not independent of the history, then it must be generated by a push-down automaton (context free language) or even a full Turing machine). If I take a random walk on a graph, and, after coming to a vertex, I assign equal probability to leaving by any edge, then I get your stochastic Laplacian, above. Or, as John Baez suggests, I could twiddle the edge weights, and preferentially leave on some edges. Or I could twiddle the exit probabilities *at each vertex* (i.e. each edge has two weights not one, depending on whether one is coming or going), and recover a classic Markov chain (minus diagonal) instead of the Laplacian. In measure theory, measures must the real (and positive), and so the measure assigned to a language (the set of all random walks on graph) is real-valued, and thus “stochastic”. Perhaps(?) one can contemplate measures with an additional U(1) in them, and perhaps this is what the quantum walk is providing!? So when I ask “what other sets can the monoid act on, and what would the Laplacian, etc. generalize to in such cases?” then perhaps I am contemplating set-valued measures on languages? Hmmmm. Sorry for the long post. Sometimes, mathematics is like a visit to a candy shop; each treat looks more delicious than the last, and picking out just one to enjoy is just too hard. p.s. I goofed in my last post, I mis-characterized what the definition of the language of an FA is. (It’s the sequence of vertexes, not the sequence of edges; the edge sequence is the coding; the vertexes are the plain-text.) Caveat Emptor. Fascinating! It seems this is going to be another of your great series, John! I can’t wait to read the next one. BTW, networks are pretty like hypergraphs (I think I told you it before…) and I found very brainy the “map-of-internet”. Off-topic: how did you write the text in boxes! Just curious! I am planning to release my domain soon and this class of tricks could be useful for me LaTeXing article series. Thanks for the comment. John might have changed it a little bit, but my original suggestion was to use the html to create the boxes (I just copied this from what is used on the Azimuth forum). It seems this is going to be another of your great series, John! I am thinking, now, to an unification of the two physics description. If the Hamiltonian is a function of the wave functions, and it can be real or complex, then the stocastic and quantum description is the same: it is possible to write the Taylor series with wave function terms and complex number. In other word, the solution can be the same for stocastic, or quantum, evolution. For example, if a Hamiltonian matrix is symmetric from this property, we can say that all stationary states can be chosen to take only real values. This is a physical (sub) consequence of what Piotr mentioned—sub because it is only a consequence of the fact that the Hamiltonian has real entries. If they’re real non-negative, this additional restriction results in additional mathematical properties. I agree that it’s a very nice property that unitary quantum dynamics under Hamiltonian -iH is identical to stochastic dynamics under Hamiltonian H. The methods to solve/simulate one type of dynamics can therefore be transferred to the other. • T. H. Johnson, S. R. Clark, and D. Jaksch, Dynamical simulations of classical stochastic systems using matrix product states, Phys. Rev. E 82 (2010), 036702; arXiv:1006.2639.
if you’re interested. We plan to publish more work on this very soon. I have found this post to be extremely well written and clearly explained, and overall very easy to follow. Nice work! Looking forward for the rest of the series. Thanks for the nice post. 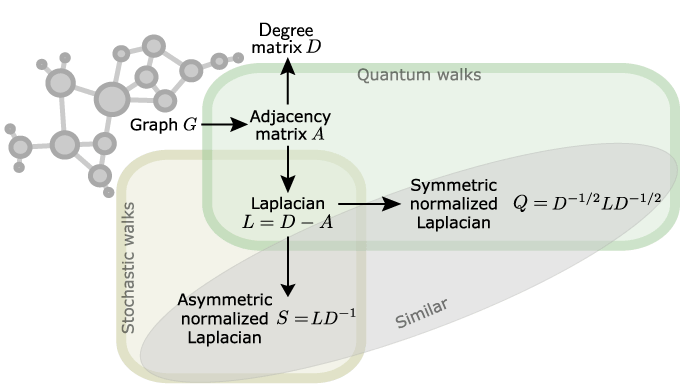 I am curious as to why the “aysmmetric normalized Laplacian” is defined as it is. Specifically, I am more used to seeing an operator that is the transpose of , i.e., Then, at least in the contexts that I have studied, it is natural to introduce the inner product and the operator is self-adjoint with respect to this inner product. The inner product is natural in many contexts, where the elements of encode a measure of the “importance” or weight associated with each node. Thanks for the comment! I think the matter of the transpose is easily resolved. We consider stochastic (or transition) matrices to act to the right on column probability vectors. Others consider them to act to the left on row probability vectors. The difference between the two formalisms is just a transpose. As for the inner product, that is a nice fact, thanks for pointing it out. Do you have a link to any of the contexts in which you came across it? i. I think it’s the difference between letting operators act to the left, or in our case, the right, on probability vectors. ii. Even in the wikipedia definition of “random walk normalized Laplacian” it’s defined as mentioned. iii. For the inner product, please provide a link so I can look at how it’s used exactly. iv. We are forced to work in the site basis, of the walker. This is the basis that an operator must be self adjoint with respect to. We can redefine the inner product, to take away the asymmetry, but we could also just multiply by D to accomplish the same goal While it’s true that you define self adjoint with respect to an inner product, it’s not clear how that helps us in any way. In fact, if you try to write the operator with respect to this new inner product, it just removes D as we already mentioned. Thanks. I should clarify that “the contexts that I have studied” are quite far removed from the random walker setting being discussed here. I also asked the question naively, without having read your paper. The contexts that I am familiar with are discrete Laplacians modeled on the Laplacian of a Riemannian manifold. Typically the domain would be a geometric simplicial complex, and would be such That is a diagonal matrix whose entries are the volumes of closed (Voronoi) cells associated with the vertices: they sum to the volume of the manifold. There is a lot of development of this idea into a “discrete exterior calculus”, where can be seen as an instance of a discrete Hodge star operator. Interesting. Thanks for the links, I’ll be sure to check them out. I was meaning, as you mentioned. The books I have seen use the definition we use however. Small typo: phi_k -> above the diagram in the section on the normalized laplacian. I don’t see this typo. Did I already fix it? If not, please say more specifically where it is. .. Each acts as identity only on vectors in the space spanned by $phi_k$ and as zero on all others,…. This is before the end diagram summary of the section on normalized laplacians. You can search for the word projector and see it. Not me! Tomi Johnson wrote this post! In this blog post I will introduce some basics of quantum mechanics, with the emphasis on why a particle being in a few places at once behaves measurably differently from a particle whose position we just don’t know. It’s a kind of continuation of the “Quantum Network Theory” series by Tomi Johnson about our work in Jake Biamonte’s group at the ISI Foundation in Turin.